We pride ourselves on providing a caring, compassionate and safe environment for your best friend. 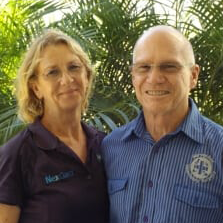 Dr Ron McKay, BVSc and his associates have been providing gold-standard veterinary care to the animal population of Hervey Bay for over 20 years. Caring for all creatures great and small, Dr McKay and his team have continued to update and upgrade the practice to ensure only the latest and best medical practices are adhered to. Hervey Bay Veterinary Surgery offers a membership programme to help our clients spread the ever-increasing costs of routine care over the course of the year. This programme includes annual vaccination, microchipping, routine blood and urine testing, parasite testing and, depending on your pet’s age, either desexing or dental cleaning. It also offers great discounts on flea, tick and worm prevention, as well as further discounts on non-routine medical treatment and medications. 7:00am – 5:30pm Monday - Friday Saturday 8:00am – 1:00pm After hours emergency on-call 24/7, 365 days a year – on rotation with all other Veterinary Surgeries in Hervey Bay. Our staff here at Hervey Bay Veterinary Surgery are dedicated to providing the best possible service and experience for your best friend! Our team are caring and compassionate, and highly skilled in dealing with all types of concerns. Each of our team members has their very own area of interest and expertise, including avian and exotic medicine and care, dentistry, critical care, large animal care and laboratory diagnostics. They go out of their way to advance their knowledge with continuing education courses, seminars and external training. If they don’t have the answer you are looking for, they will know where to find it! Dr Ron has been a veterinarian for almost 40 years. He prides himself on continuously educating himself on the most current and progressive veterinary practices. Jenny has a significant background in wildlife, having formerly owned the wildlife park that used to be across from Eli Waters Shopping Village. Ron and Jenny both have a keen interest in adventure, visiting Machu Picchu, Everest, and the Galapogos, as well as skiing in that cold white stuff. Dr Ron also has a special interest in orthopaedic surgery and large animal medicine and is currently one of the few veterinarians in our area that treat large animals. 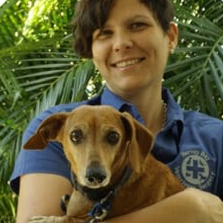 Candice graduated from the University of Queensland as a Veterinarian in 2009 and has been a key member of our team since then. She has completed numerous external courses, including opthalamology and internal medicine, and has a keen interest and ability in ultrasonography. When Candice isn’t at work, she enjoys spending time with her family, sewing and camping. 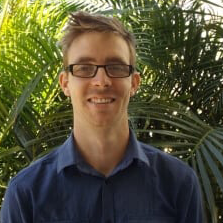 Rhys graduated from James Cook University as a Veterinarian in 2014. 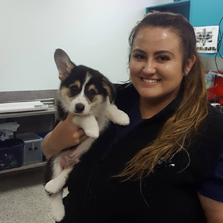 Following graduation, he was involved in a rotating internship at Queensland Veterinary Specialists in Brisbane, prior to joining our team in 2015. Rhys has a strong interest in surgery, especially orthopaedics, as well as diagnostic medicine. When he gets a chance, he enjoys spending time with his family camping, and enjoys playing hockey and tennis. 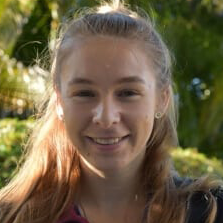 Sky graduated from the University of Queensland as a Veterinarian in 2017. She is the oldest of four brothers and sisters living on the Sunshine Coast, whom she visits regularly. Sky has a keen interest in all this medicine and diagnostic, particularly cytology and microscopy. In her spare time, she enjoys any outdoor endeavour and loves to binge-watch the occasional crime series on Netflix. 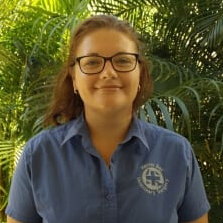 Tiana comes to us from California, where following the completion of her Bachelor’s Degree in Animal Biology at UC Davis, graduated from the University of Melbourne as a Veterinarian in 2018. During her time in Melbourne, Tiana completed placements at Australia Zoo and Currumbin Wildlife Sanctuary. She has a keen interest in emergency and critical care, as well as neurology. 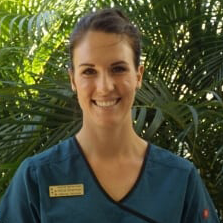 Narissa graduated from university in Michigan in 2007, moved home to Hervey Bay in 2008 and has been with our practice since then. She has a background in dentistry, emergency/critical care and anaesthesia, but an interest in clinical pathology. While the majority of her time is spent behind a desk these days, she still comes out to help catch a puppy or two during a c-section, or to mingle with our clients. 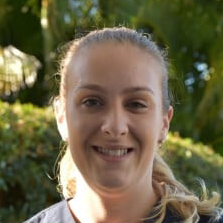 Alicia graduated from the University of Queensland in 2013 and has been with our practice since then, heading our nursing team. In clinic, she has a keen interest in surgery and continues to expand her knowledge through many additional courses. Alicia has a cat, two crazy Jack Russell Terriers, and 3 horses and spends much of her time caring for them. 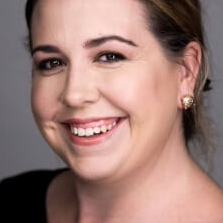 Anita graduated from the University of Queensland in 2013 and has been with our practice since 2015. Being an integral part of our nursing team, Anita has a primary focus on surgery and patient care with an interest in large animal medicine. When she is not working hard, she is playing with her dog Indie, or spending time with her family. 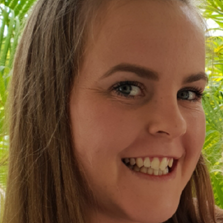 Jess graduated from the University of Queensland in 2014 and came to our practice in 2018. 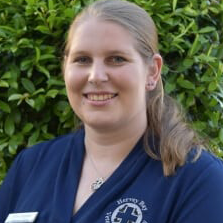 Two of her practical rotations included the primary urgent care facilities in Brisbane. Following university, Jess was employed by the Animal Welfare League, where her valuable skills went to assist many rescued patients. Jess has two cats - Sootie and Emma, and enjoys fishing, painting and drawing. 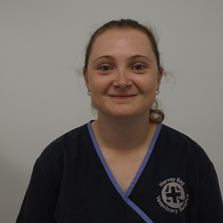 Renee is one of our veterinary nurses, who started with us in May, 2016. From a young age, Renee knew she wanted to help animals. Renee has a keen interest dentistry and dental radiology and continues her education in this area. Renee has three fur-babies that adopt the majority of her down time. Kristy has been involved in the animal industry since she was 15yrs old. 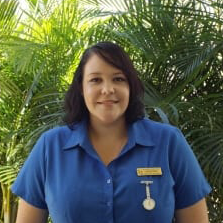 She holds a Certificate II in Animal Studies and has had 8 years’ experience, working in clinics on the Gold Coast as an assistant nurse and client care manager. After dipping her toes into pet retail management for 4 years, she joined us in August 2016 where she fronts the reception desk with Jenny & Shari. She enjoys caring for and going the extra mile for both our patients and their owners. Kristy has a special interest in nutrition and behaviour and is one of our puppy preschool instructors. Shari joined us in January 2018. She co-hosts the front of house with Jenny and Kristy and brings a phenomenal amount of knowledge and customer service to our desk. Shari holds a Certificate IV in Veterinary Nursing, as well as a Bachelor’s Degree in Applied Science – Wildlife. She devotes a tremendous amount of her personal time to her wildlife-saving pursuits and does a fantastic job. Shari has a cat named Willow. Bianca started with our practice in January, 2019. She obtained her Certificate IV in veterinary nursing in 2017. Bianca’s primary focus is to provide much needed additional support to our front office team, and brings an abundance of skill, personality and product knowledge to do so. When she is not working hard, she is spending time with her family camping. After hours emergency on-call 24/7, 365 days a year – on rotation with all other surgeries in Hervey Bay.